Everyone knows, or should, the Baseball Pitching Grips are the initial start to throwing different types of pitches. The grips determine the rotation of the baseball as it’s thrown, which dictates movement or non - movement. However, as all pitches begin with a standard “How to Hold” grip, then spin off from there, I always teach that grip first. To throw a four seam fastball you begin by gripping the baseball across the seams with your front two fingers. Your thumb is under the ball placed nearly in between the top two fingers. You should not squeeze the ball. Rather hold it as if it were an egg or a crystal ball. There should be a small gap between the baseball and the palm of your hand. The four seam fastball traditionally is the fastest variation of the fastball grips, but it is also the straightest. That is, the pitch relies more on speed than movement to make the hitter miss. 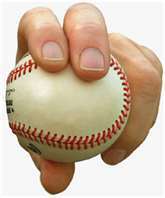 Two Seam Fastball Baseball Pitching Grips is held with the front two fingers directly on line with the baseball’s seams. The thumb is placed under the ball directly underneath the top two fingers. Again, do not squeeze the baseball and leave a gap between the ball and the palm of your hand. The two seam fastball, due to rotation different than that of a four seam fastball, will produce more movement on the ball. This movement is meant to compensate for the slower speed which the four seam fastball travels. Assuming you have mastered the grip and control of the two different fastballs, a huge assumption I know but let’s assume it anyway, now you must decide when you want to throw each individual pitch. Should you be an over powering hurler, I would suggest you throw your four seam fastball to get ahead of the batter in the count. On an 0-2 , 1-2 or 2-2 count I’d throw the two seam fastball. The movement and variation of speed is an excellent way to provoke a tense, 2 strike hitter to chase. On the other hand, should you be an over powering pitcher and it’s early in the game, 1st to 4th inning, I’d be inclined to throw nothing but four seam fastballs and save my two seam until later in the game for a possible, “game Saving” strike out. Should I be a pitcher of average speed and velocity, my strategy completely changes from the over powering thrower. I would only throw the four seam fastball as a Display pitch. In other words, I would rarely throw it for a strike. I’d throw it either outside or inside off the plate two to three inches. This display pitch shows the batter you do possess a four finger fastball, which keeps it in the back of his mind he must watch for it. The more things you can make a hitter think about, the better chance of confusing him. I’d rely on my two seam fastball for strikes. Of course there’s always the sneaky method of slipping a four seam fastball by the hitter when he’s guessing another pitch.